Traffic on Jawaharlal Nehru (JLN) Marg. 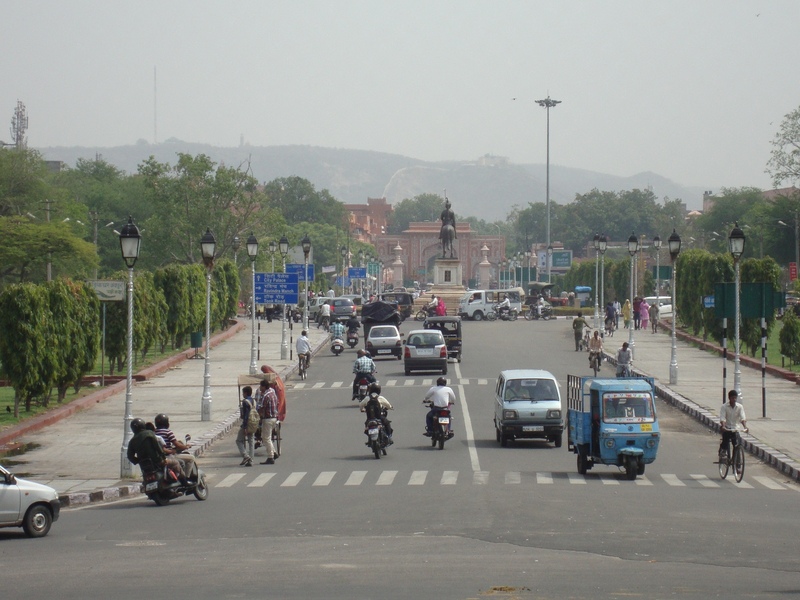 The streets of Jaipur, India’s eleventh-largest city and capital of the state of Rajasthan, swarm with traffic. On the broad boulevards that outline the city, bicycles, motorcycles, and three-wheeler rickshaws mingle with four-wheeler cars, trucks, and buses. On the margins of the roads, other forms of transport head toward their destinations: pedestrians, cycle-rickshaws, horse tongas, and the occasional camel cart. Different types of rickshaws on a street in Jaipur. Autorickshaws are three-wheeler taxis adapted from scooter technology. 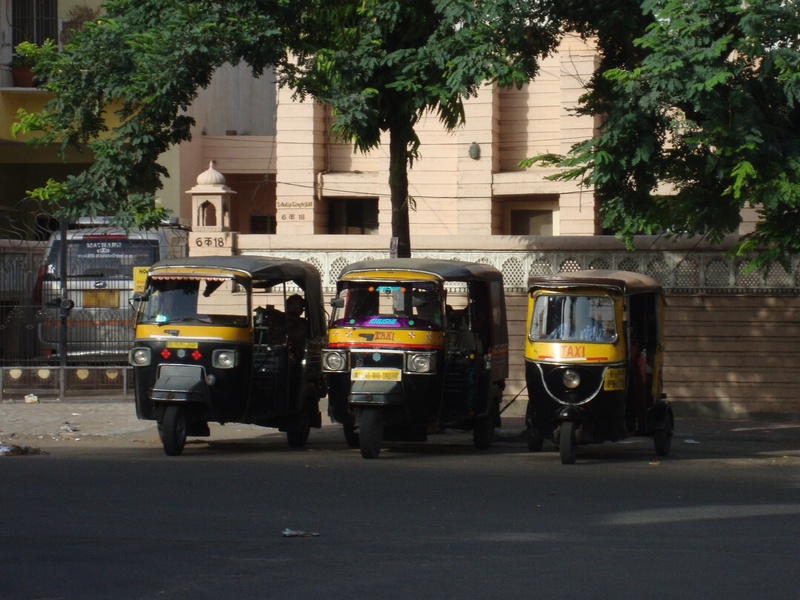 In India, three-wheeler taxis are a compact, economical form of transport, used for transporting people to specific places in cities and rural areas alike. The two most common brands of autorickshaw seen on the streets of Jaipur are Piaggio—the original producer of three-wheelers—and Bajaj, which initially produced Piaggios under license. All auto-rickshaws I have seen retain their scooter heritage with handlebar steering. Many of them have two-stroke engines and manual starters; some newer rickshaws have four-stroke engines and electric starters. In their everyday use, autorickshaws are pressed into service for a variety of different tasks. In rural areas, they are often used to haul goods such as bags of rice. Their most important use, though, is transporting people. A typical Bajaj autorickshaw seats two passengers comfortably—and many more uncomfortably. Most rickshaws in Jaipur have a padded ledge behind the driver’s seat, which additional passengers can sit on if needed. Western journalists and car enthusiasts have spilled much ink in identifying the Hindustan Ambassador as the iconic car of India. 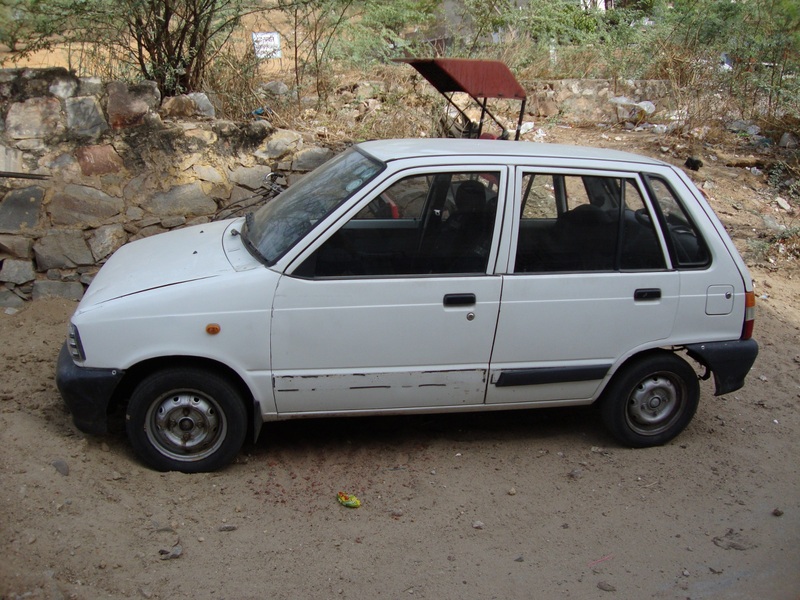 I think that the Maruti 800 (see below) should now hold that title, as it has long since surpassed the Ambassador as the most common car on Indian streets. 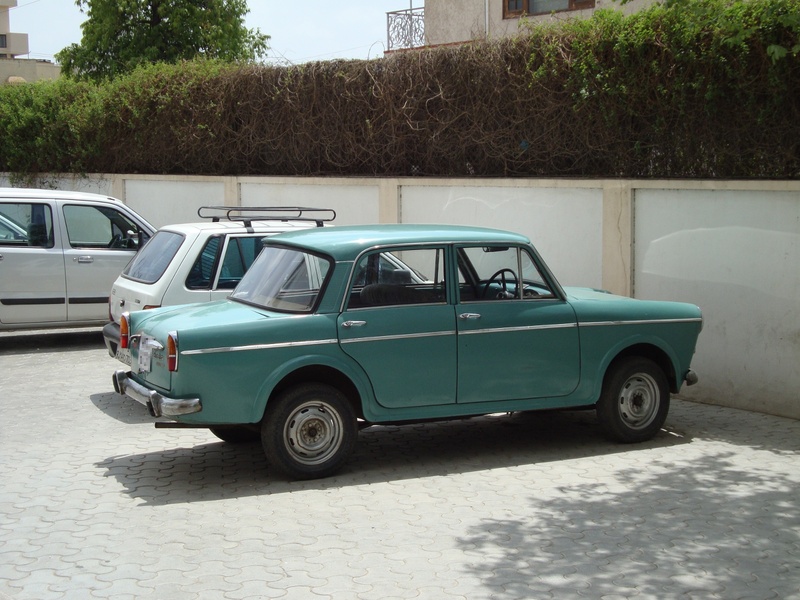 Nevertheless, the Ambassador is still a distinctively Indian car, and even in 2012, it is still commonly seen on the streets of Jaipur. 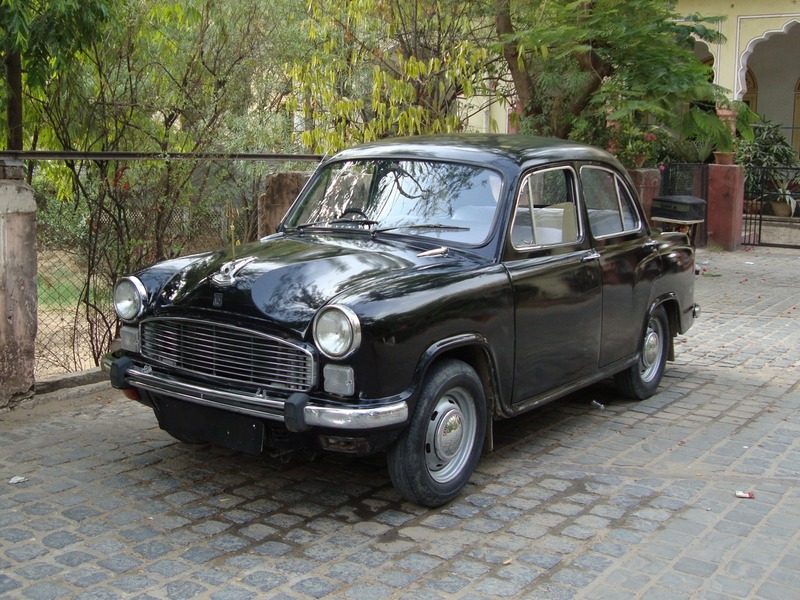 First produced in India in 1958, the Ambassador was based directly on an English car design, the Morris Oxford. Under Indian governmental regulations in the early independence period, auto-makers were allowed to import technical expertise only for the establishment of a production line, not for its modification to match technological changes. These regulations were intended to reduce India’s dependence on foreign technology. The result of these regulations, though, was that auto-makers such as Hindustan Motors in Calcutta (now Kolkata) produced their vehicles virtually unchanged for decades. Domestic demand for cars far exceeded supply, to such extent that waiting periods for a new Ambassador often exceeded two years. Many Ambassadors were bought by central, state, and local government officials, who used their connections to jump ahead in the waiting lists. Even to this day, the majority of Ambassadors driving the streets of Jaipur are white and have a red “Rajasthan Sarkaar” (Government of Rajasthan) license plate. The Premier Padmini is another Indian car that was produced unchanged for years. Based on a Fiat design, it is smaller and boxier than the Ambassador. It never acquired the international prestige of the Ambassador, even though it was a more highly sought-after car in the pre-Maruti days. A Premier Padmini spotted in Jaipur. One of the many Maruti 800s based in Jaipur. The Maruti 800 was the first automobile to enter into widespread (upper) middle-class ownership in India. The Maruti began life as the pet project of Sanjay Gandhi, son of Indira Gandhi and heir-apparent to the Nehru-Gandhi dynasty. After Sanjay was killed in a plane crash in 1980, the Maruti company was dissolved and reconstituted as a public-sector company and a subsidiary of the Japanese auto-maker Suzuki. Suzuki imported the technical expertise to produce an up-to-date car, a capacity that the Indian auto industry did not have at the time. The first Maruti 800 rolled off the assembly line in late 1983, and within a few months, the company was producing a hundred cars a day. The Maruti 800 was—and still is—a commercial success, and Maruti Suzuki has gone on to produce other successful vehicles, such as the Omni minivan. 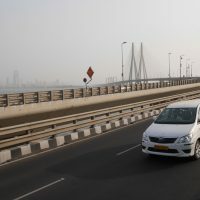 Since the introduction of the Maruti 800, other Indian-made cars, such as the Tata Indica, have successfully targeted the upper-middle-class Indian market. But the Maruti 800 got there first, and it is still the most common private vehicle on Jaipur’s streets. A white Tata Nano. The Nano comes in a variety of other colors, including orange. Tata, India’s largest industrial conglomerate, has stakes in a wide variety of industries, ranging from salt and bottled water to vacation homes. Tata is also one of India’s leading manufacturers of motor vehicles. The company produces most of the distinctive orange trucks that ply India’s roads, as well as many of the buses. In 2006, Tata set off to produce a rather different type of vehicle: the Nano. By producing a small, inexpensive four-seater car, Tata hoped to make the Nano accessible to the middle class, just as the Maruti 800 was the first automobile accessible to the upper-middle class. Tata announced that it would make its middle-class car available for the price of only one lakh (100,000) rupees (roughly US $2,000). In its original goals, as the western press reported, Tata seems to have failed. The price of the Nano exceeds one lakh, and Indian consumers have shown that they would rather buy a nicer, more expensive car, than a cheap car. But let us not dismiss the Nano too quickly. Western news reports would have one believe that nobody bought the Nano. This has simply not been the case. 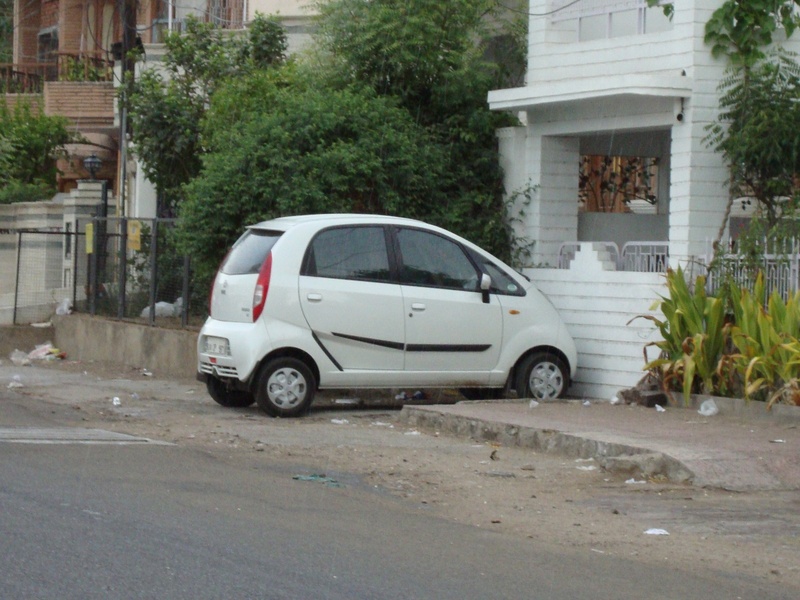 The small cars are very much in evidence on the streets of Jaipur, driving down the street or parked outside of upper-middle-class homes. Bhargava, R.C., with Seetha. The Maruti Story: How a Public Sector Company Put India on Wheels. Noida, India: Collins Business, 2010. Edgerton, David. The Shock of the Old: Technology and Global History Since 1900. Oxford: Oxford University Press, 2007. Sardar, Ziauddin. “The Ambassador from India.” In Autopia: Cars and Culture. Edited by Peter Wollen and Joe Kerr. London: Reaktion Books, 2002.